SEOUL, March 24 (Yonhap) -- A joint dialogue panel of business and labor representatives is set for a final round of negotiations this week to reach a deal on the ratification of key international labor conventions. The reform committee under the Economic, Social & Labor Council (ESLC) will hold a general meeting Thursday to resolve the long-pending issue over the extent to which South Korea will ratify the International Labor Organization (ILO) conventions, according to ESLC officials on Sunday. Thursday's meeting will effectively be the last meeting before the panel's March deadline for the agreement. If the panel fails to strike a deal, the ratification will be sought through amending related laws at the National Assembly, but it's an unlikely scenario as any bid to change the law without the panel's consensus will be hit by opposition from each party involved. The ratification of ILO conventions is a key labor issue in Korea, as its delay has been pointed out by the European Commission as an urgent matter to be settled. Business and labor unions remain particularly divided over the proposals from the industry side. Businesses have called for allowing substitutes to make up for a lack of personnel during a strike and abolishing punishment of employers for obstructing labor activities. The labor side has emphatically rejected the proposals, saying it's against the spirit of the ILO and the labor rights guaranteed by the Constitution. 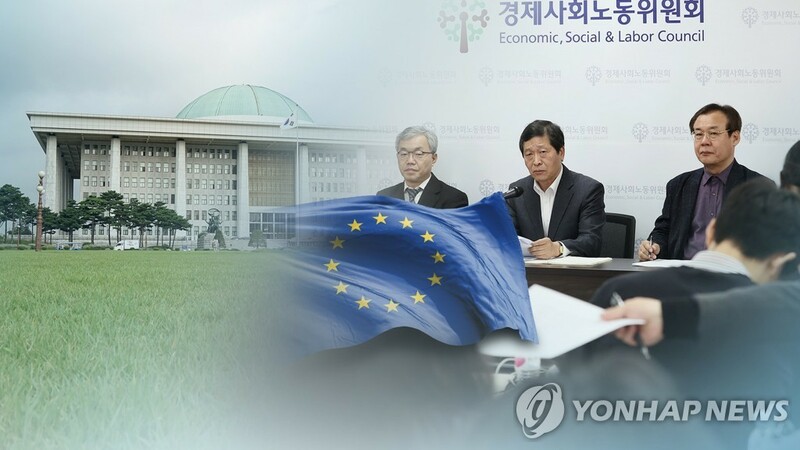 A European Union delegation visited Seoul in January and held talks with South Korean officials, in which they called for a swift resolution by early April. It warned it could send an expert panel of its own to Korea to further enforce ratification, which would include a review of possible violations of Korea-EU free trade agreement due to the delay in ratification. A council including labor, management, government and representatives of various social strata was launched last year as a social dialogue group to discuss labor issues, including the ratification of the ILO conventions. Failing to ratify the ILO provisions does not necessarily lead to additional tariffs or penalties, but the Korean government is worried that a delayed process could act as a barrier to expanding free trade between the two sides.